(4:1-3) God tells Ezekiel to make a clay model of Jerusalem, complete with a fort, camp, and battering ram, and an iron pan for a wall around the city. 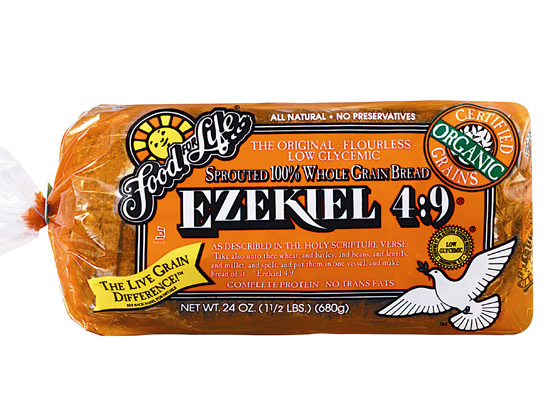 Ezekiel's clay model and iron pan will be a sign to everyone in Israel. (4:1) "Son of man, take thee a tile, and lay it before thee, and pourtray upon it ... Jerusalem." (4:2) "And lay siege against it, and build a fort against it ... set the camp also against it, and set battering rams against it round about." (4:3) "Moreover take ... an iron pan, and set it for a wall of iron between thee and the city ... This shall be a sign to the house of Israel." 4:4 Lie thou also upon thy left side, and lay the iniquity of the house of Israel upon it: according to the number of the days that thou shalt lie upon it thou shalt bear their iniquity. (4:4-8) God makes Ezekiel lay on his right side for 390 days, and then on his left side for another 40 days. "And thou shalt not turn thee from one side to another, till thou hast ended the days." 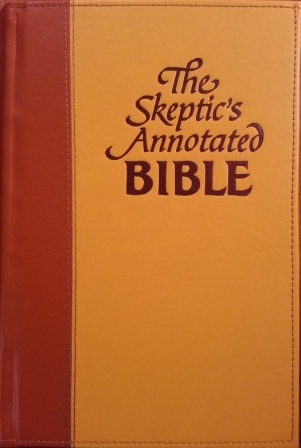 (4:4-5) "Lie thou also upon thy left side ... three hundred and ninety days." (4:6) "And ... lie again on thy right side ... forty days"
(4:8) "Behold, I will lay bands upon thee, and thou shalt not turn thee from one side to another, till thou hast ended the days." 4:9 Take thou also unto thee wheat, and barley, and beans, and lentiles, and millet, and fitches, and put them in one vessel, and make thee bread thereof, according to the number of the days that thou shalt lie upon thy side, three hundred and ninety days shalt thou eat thereof. (4:9) "Take thou also unto thee wheat, and barley, and beans, and lentiles, and millet, and fitches, and put them in one vessel, and make thee bread thereof." It's supposed to be made according to the recipe given in this verse and is said to be a complete meal that satisfies all nutritional requirements. 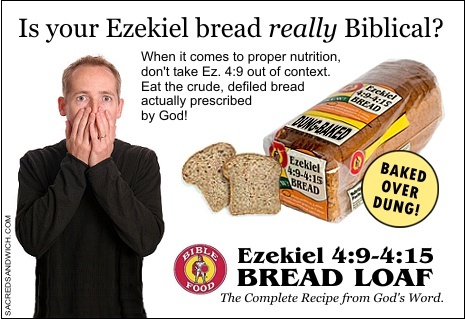 It seems like pretty good bread to me, too, but I'll bet it doesn't use the procedure described in Ezekiel 4:12. (4:12) "Thou shalt bake it with dung that cometh out of man." (4:15) "Then he [God] said unto me [Ezekiel], Lo, I have given thee cow's dung for man's dung, and thou shalt prepare thy bread therewith." God punishes everyone in Israel with a drought and famine. (4:16) "Son of man, behold, I will break the staff of bread in Jerusalem." (4:17) " That they may want bread and water." 4:17 That they may want bread and water, and be astonished one with another, and consume away for their iniquity.